Some wearers of colored contact lenses love a dramatic and non-natural effect, but there are also many that are eager to create a look that is perceived as natural. A desire for a natural look is especially common among wearers that use colored contact lenses in their “everyday humdrum life”, as apposed to only using colored contact lenses for parties, night clubs, dress up, on stage, and so on. Below, you will find some information that we hope will be helpful if you are striving for a natural look. If you strive for a natural look, chose colored contact lenses designed to mimic the colored part of the eye (the iris). If you look closely at your own iris, you will notice that it is probably not one solid color. Instead, it sports shades and lines of various tints and saturation. You may see tiny colored dots or radially arranged lines and shapes. This is why solid color contact lenses tend to look unnatural. Another option is to use enhancement lenses rather than non-transparent (opaque) lenses, but they can not be used to make a major eye color change and they are not very good at hiding imperfections. To achieve a natural look, the iris part of the contact lens should not be significantly smaller or larger than a normal iris. The outline of the iris and the outline of the pupil should also be the same as for a normal human eye. Avoid jagged pattern and similar. The center of the iris should be clear to allow your own pupil to show through. It is possible to get colored contact lenses where no pupil is visible or where a pupil is mimicked in the “wrong” place, but such lenses always create a strikingly unnatural look and are normally used specifically to achieve that type of dramatic effect rather than mimic natural looking eyes. 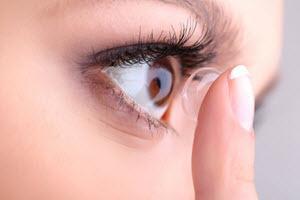 If you want your eyes to look natural even when you are using colored contact lenses, it is a good idea to pick colored contact lenses that aren’t that far from your natural eye color. Of course, the rest of your look will impact how your eye color is perceived. A brown-eyed person with pale skin and hair (natural or dyed) in a natural-looking blond shade is more likely to achieve a natural look with blue colored contact lenses than a brown-eyed person with ebony skin and jet black hair. Of course, there are people with ebony skin and jet black hair whose natural eye color is blue, but since it is so rare many people will perceive it as an unnatural look even if it isn’t. The same goes for the naturally pale skinned person with blue eyes who spends a lot of time in the tanning booth and dyes her hair and eyebrows black – all of a sudden blue colored contact lenses can be perceived as less natural than before, and brown colored contact lenses would be recognized as a more natural look on her even though her natural eye color is actually blue. When you blink, the lense can slide a bit and this can cause the iris portion of the lense to not line up with your own iris, creating a less natural look. 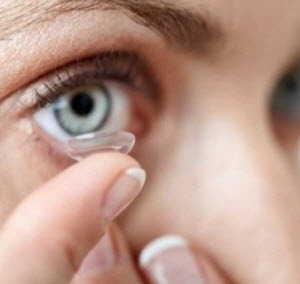 There is also a risk of the color partly or fully covering your pupil, which is especially bad if you are wearing opaque (non-transparent) contact lenses. The size of our pupils are constantly changing to suit the light conditions. In dark conditions, the pupil will expand to let in more light. If your pupil expands beyond the clear center of the lens, it will have a somewhat negative impact on your vision and you can’t reap the benefits of the enlarged pupil for improved night vision. In light conditions, the pupil with become smaller. If your pupil becomes smaller than the clear center of the lens, your natural iris can show as a ring around the pupil. Non-aligning pupils is chiefly a problem associated with the use of non-transparent (opaque) colored lenses, not enhancement lenses. N.B! Keep in mind that certain drugs and medical conditions can cause your pupils to change in size, creating the same effect as dark conditions / bright conditions.